Birthplace : Palm Desert, California, U.S.
Queens of the Stone Age is an American rock band formed in 1997. 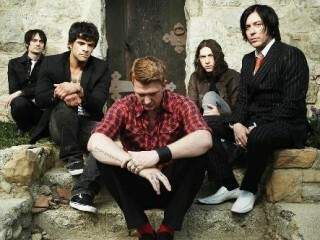 The band's line-up includes founding member Josh Homme (lead vocals, guitar), alongside longtime members Troy Van Leeuwen (guitar, backing vocals) and Joey Castillo (drums, percussion), and Michael Shuman (bass guitar, backing vocals) and Dean Fertita (keyboards, guitar, lap steel) who joined the band in 2007. Plans of recording a follow-up to Era Vulgaris had been mentioned since 2008, but recording would not begin until January 2011. In March 2011, Homme stated, "Doing the rehearsals for the first record is really defining the new one. It's been turning the new record into something else. What we were doing was kind of bluesy, and now it's turned into this trancey, broken thing. The robots are back!" According to Homme, the album will be finished by the end of 2011. He explained to BBC Radio 1, "We're going to take our one last break that we would get for a month, come back and do Glastonbury, then immediately jump in the studio. Our record will be done by the end of the year. We have enough songs." In 2010, the band toured and released a two CD deluxe edition of Rated R on August 3, 2010. This edition featured the original CD along with six B-sides and live recordings from the band's Reading performance in 2000. They released a remastered version of their first self titled album early 2011. They have also played at the Australian festival Soundwave in 2011. The band performed on Conan on April 14.On June 26, 2011 they appeared at the Glastonbury Festival, in Somerset, UK. They also played at Pearl Jam's 20th Anniversary Festival at Alpine Valley in East Troy, WI on September 3 and 4, 2011.In November 2011, frequent collaborator Alain Johannes stated that he was currently in the studio with the band, stating, "We had a late night with Queens again. [...] Just putting in days, super top secret, but it’s going to be amazing. I’m really excited about it. [...] Once we start the process, it goes to completion. So I can’t say exactly when, but it’s a really good start." View the full website biography of Queens Of The Stone Age.